Hong Kong – 15 January 2018, CALC (the “Group”, SEHK stock code: 01848), a full value-chain aircraft solutions provider for global airlines, is pleased to announce that it has received “Aircraft Lessor of the Year 2017” at the Global Transport Finance 2017 Annual Awards Ceremony held in London on 9 January. The award marks the third year that CALC has won recognition from the international community for its professionalism and know-how in aircraft leasing and aviation financing, and as one of the most important players in the global aviation industry. The judging panel acclaimed CALC for its strong orderbook, which was further strengthened with two bulk orders it placed during the year. The Group purchased 50 new Boeing 737 MAX series aircraft in June 2017, and has recently ordered 65 additional Airbus A320neo aircraft. The orders made its total orderbook with Airbus and Boeing increased to 267 aircraft, a remarkable achievement underpinned by CALC’s decade-long and dynamic relationship with the manufacturers. The Group currently owns a fleet of 108 aircraft, and its backlog after the new order stands at 193 aircraft (143 Airbus and 50 Boeing). The financings the Group has put in place also differentiated the lessor from its peers. At the end of 2017, CALC has launched China’s first asset-backed security (ABS) denominated and settled in a foreign currency, which is also the first ABS in aircraft leasing in the public placement market. This is the latest strategic step CALC has taken to develop innovative finance products with aircraft leasing as the underlying asset. 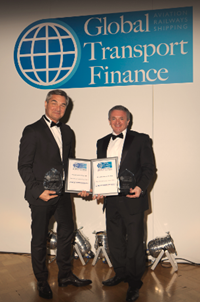 Over 17 consecutive years, Global Transport Finance has hosted its Annual Gala Awards Ceremony to recognize the remarkable contributions industry specialists have made to the transport finance industry and the best deals in the aviation, airports, shipping, rail, road and legal transport finance markets. As the only aircraft lessor to be named “Aircraft Lessor of the Year” for three consecutive years, the Group does not only demonstrate its exceptional strength as a provider of one-stop and flexible aircraft solutions for airlines around the world, but also solidify its key position as a full value-chain aircraft solutions provider. Its long-term commitment to the global aviation industry and innovation will continue to be a strong catalyst for its further development and business growth in 2018.